Children doing tantrums on breakfast table is quite common and ‘parents feeling guilty about not being able to make them drink enough milk’ is the story of every Indian home. Even as adults we feel accomplished if we have had our quota of milk for the day for breakfast. Milk with fruits, may be an egg and may be some cereal is what most people think when they plan for breakfast. 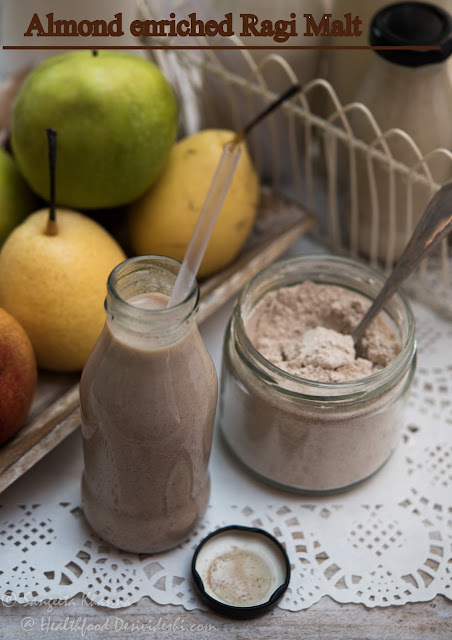 Making a milkshake that packs some more proteins and is delicious makes sense if you want an instant option every day. Homemade from scratch and yet instant for consumption I mean, not the chemically flavoured cereals and malted drinks. The other day my sister was telling how her 5 year old son doesn’t eat enough protein although he loves fruits and small servings of homemade snacks. Like most mothers she also thinks that the morning breakfast time milk could be a little enriched with protein so the kid gets a good start of the day. Another friend of mine whose adult son keeps a close watch on his diet on week days and binges on weekends was discussing how she could make something for a week so he could have a quick milkshake that is fortified with protein and yet tasty. Most of us like milk but it gets boring if it is the same plain milk every day. Fortifying the fresh milk with some protein from nuts and seeds can make a delicious healthy breakfast everyday. The problem with young working adults is that the work schedules are erratic and breakfast takes the toll. Many of them just skip breakfast which is not as bad contrary to the belief, those who opt for packaged instant cereals or get a loaded sandwich from office canteen need to fix the breakfast a little better. It actually doesn’t take as much effort as it looks like. High time we start seeing good old milk as a staple meal just as we did some 3 decades ago. In fact one can do all the work once a week and get a ready milk based breakfast every day. Some 30 minutes a week for a nourishing protein rich breakfast every day I mean. Isn’t that something you could do? All of us depend on milk a lot as I mentioned. 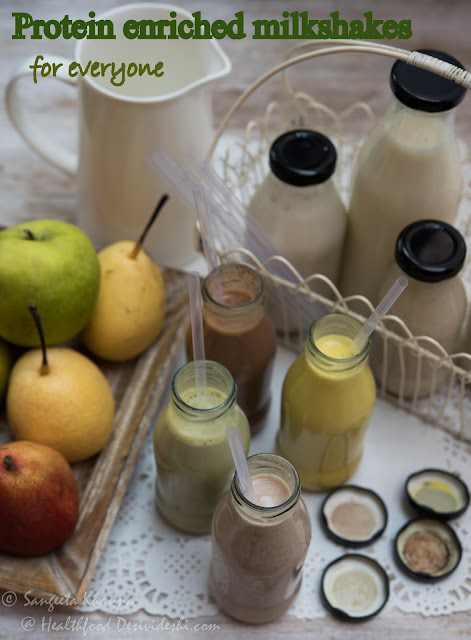 I love milk too, making flavoured drinks with milk is easy even if you want to stay away from chemical flavours and colours. Please don’t use packaged rose syrups or jams to make the milkshake your family loves so much. A few real ingredients are not that difficult to process at home. I like adding almonds to my milk a lot. Just soak some almonds and make a paste the next day, skin and all. No filtering not straining. Then add some real food flavourings to the paste and add to fresh milk, preferably full fat. Make different flavourings for different days, different family members and so on. Your breakfast is sorted for the week. To make almond protein enriched milk I use a mix of 100 gm almonds and 50 gm melon seeds for 2 L full fat fresh milk. Once the nuts and seeds are soaked with water, blended smooth with a little more water it results into about 2.5 L flavoured milk. Here are the ways I like flavouring my milk and actually adding value to the protein enriched milk for my breakfast. To the above protein enriched milk I add some pure Vanilla extract to make it nice vanilla almond milkshake. We love it this way the most. I normally eat my fruits for lunch but Arvind likes having a banana or apple along with his milk in the morning. You can have anything you like with it, or have only the almond and melon seeds enriched milk for breakfast. Matcha almond milk is my favourite. Health benefits of Matcha are well known, the flavour feels grassy to many people but I like it chilled. 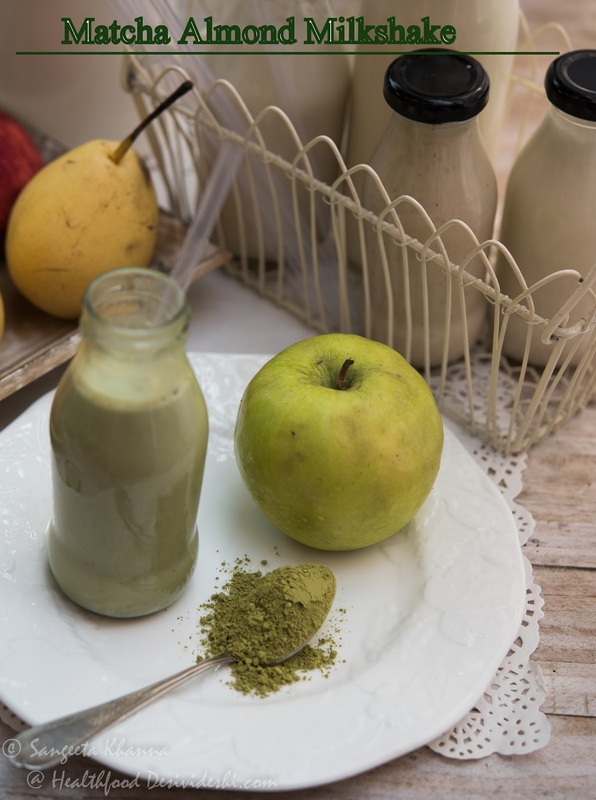 I use 2 tsp Matcha powder for 500 ml almond enriched milk, blend it nicely and refrigerate till needed. It keeps well for 4 days refrigerated. I am not a fan of chocolate but dark chocolate in chilled milk becomes my evening snack sometimes. It definitely a great breakfast too but when you have a few bottles refrigerated already it becomes a nice snack or small meal whenever needed. 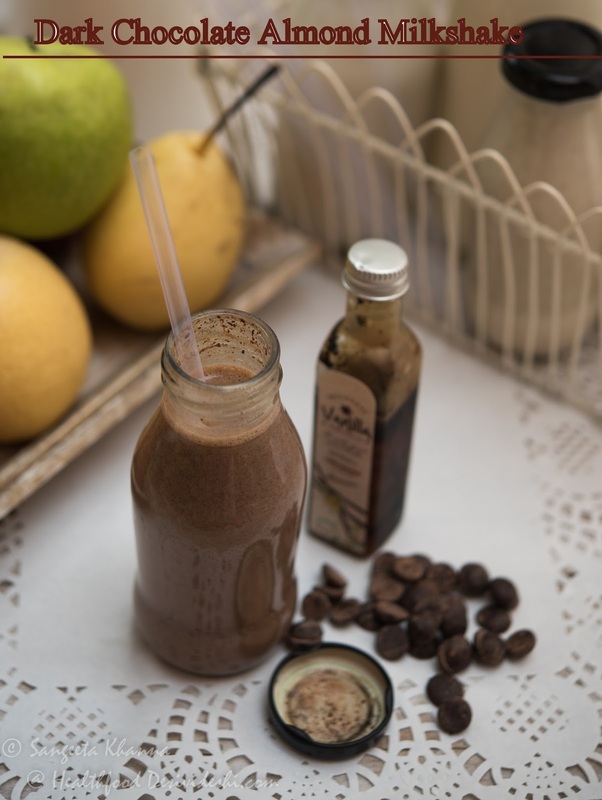 To make dark chocolate almond milk I melt 2 heaped tbsp dark chocolate chips (Callebout) in 100 ml fresh milk, then blend the melted chocolate with 500 ml of prepared almond milk. This chocolate version refrigerates well for a week. You can use good quality unsweetened cocoa powder instead of dark chocolate chips. The ragi malt version of the almond enriched milk is a favourite of both of us. I don't add sugar to these milkshakes but this ragi malt version is so delicious and has a nice aroma that you don't feel like adding any sweetener to it. To make ragi malt version just dissolve 3 tbsp powder ragi malt (available online) with 150 ml water, cook till it bubbles and blend with 500 ml of the almond milk mix. It refrigerates well for 5-6 days. 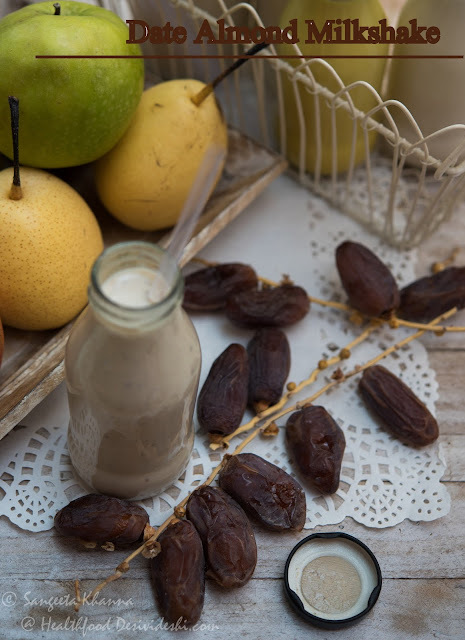 Date milk is seen as tonic and rejuvenating in ancient systems of medicine and we have been told many times how dates cooked with fresh milk become so healthy and strengthening. 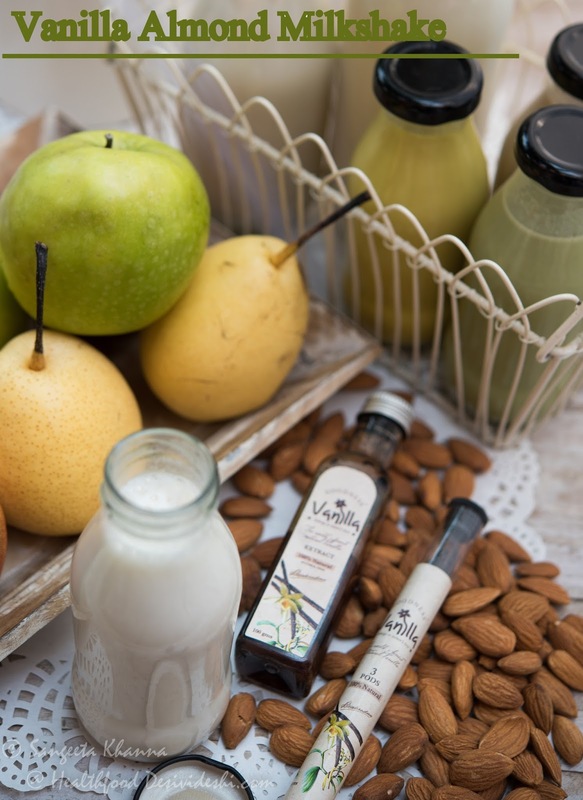 To make the dates version of the almond milk I blend 4 dates per 500 ml of the almond milk and refrigerate immediately. It keeps well for a week if refrigerated immediately after making. Turmeric is known to be healing, rejuvenating and antioxidant. 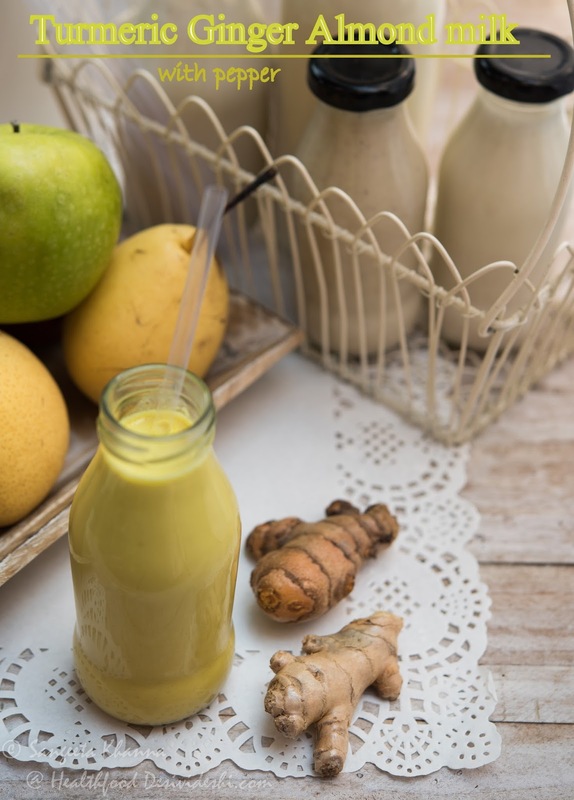 Ginger and black pepper help the actions of turmeric in the body and it makes really good flavour profile with the almond enriched milk too. Even kids have loved this version of haldi wala doodh (turmeric milk) trust me. For 500 ml almond milk made the way mentioned above, I use 30 gm fresh turmeric root and 20 gm fresh ginger root along with 10 peppercorns. Blend them all with 2 tsp water, squeeze the juice and add to the milk. There is no need to heat as the active compound (curcumin) works really well with this combination. The leftover pulp of turmeric and ginger makes wonderful ginger chai this way. 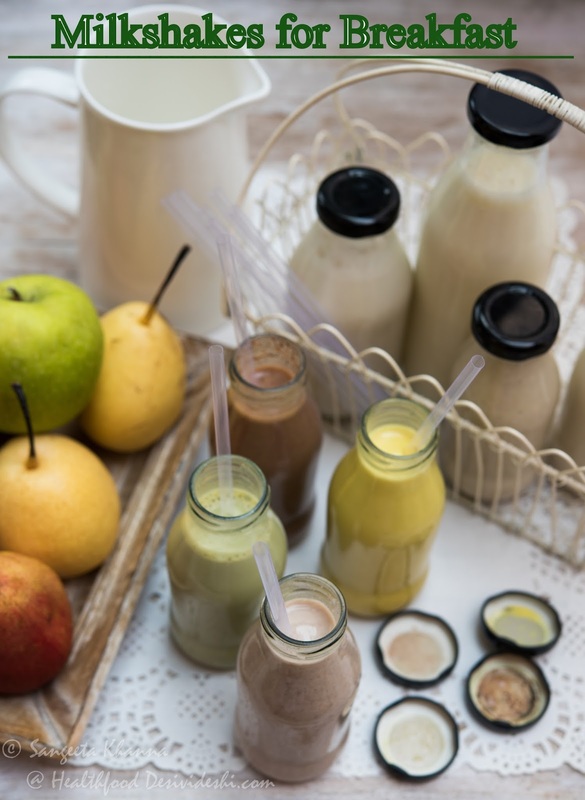 The serving portions of all these enriched milkshakes may be different for children and adults if it is being consumed as standalone breakfast. Now that you have a few flavour options for the milkshake breakfast, let me tell you how important it is to include milk especially for women and children. Dr. Sharad Pandey, an Ayurveda practitioner believes that full fat milk is essential for everyone. Even for making yogurt and other milk products the fat content should not be skimmed he says, skimmed milk reduces the chances of nutrient absorption and metabolisation by the body. Dr Pandey says good quality fresh milk should be arranged on priority for growing children as it is very critical for their growth and bones. Low fat skimmed milk can cause Vit D deficiency. 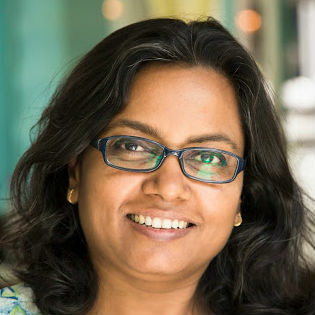 Tanya Joshi, the senior dietitian and nutritionist at Freshmen's Valley says that being a complete food, milk ranks as one of the best choices available as a part of a nutritious breakfast for the jump start of the day and remain healthy and energetic throughout. Milk is a rich source of calcium for building bones, muscles,teeth in growing children and vitamin D for its best absorption thus preventing bone diseases like osteoporosis in later stages. Milk protein fulfills body’s overall growth and physiological needs. Gives feeling of fullness for long time resulting in sensible eating, preventing binge eating. Good fats provides energy to perform daily activities. Fats are essential for the absorption of all fat soluble vitamins from milk and other foods. High quality vitamins, minerals and electrolytes in milk provides strength, boost immune power and maintains fluid balance. Do you need more reasons to include milk in your breakfast everyday? Enrich it with proteins from nuts and seeds and make it a filling meal that keeps you full till lunch time.